Zombies have run out of steam in terms of pop culture phenomena. The topic has inundated and subsequently saturated video games, television, films, and just about every other conceivable piece of media. Although the script for Maggie landed on Black List’s 2011 list of best unproduced film screenplays, it’s 2015 and far too late to make a splash or make a statement with the pop culture trend. However, if one views Maggie with an absolutely objective standpoint, they’ll certainly think more than when watching a typical zombie movie/ series. The newest film to feature the walking dead asks its viewers the hypothetical question: Would or should a person (hypothetically) transitioning to a zombie be allowed rights like any other terminally ill man or woman? What if that person was in your family? These are certainly interesting questions, but the film could, unfortunately, add more excitement as most of Maggie’s runtime simply involves a lot of waiting. Despite boasting an international action superstar in the cast with Arnold Schwarzenegger, Maggie doesn’t focus on the typical shoot-em-up violence shown in zombie movies. The former governor of California doesn’t blast away bad guys from start to finish like one would expect, and instead turns in a basic, honest portrayal of a father, Wade, coming to terms with his daughter’s terminal illness. It’s a surprising move for a man who once made over $20 million per film to star in a video-on-demand release, but the actor doesn’t get much opportunity to feature his dramatic chops these days. 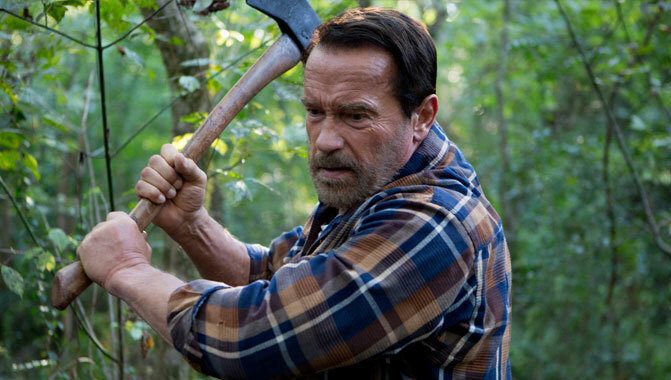 In this dreary, zombie-populated future, farmers burn their crops to prevent the zombie virus from spreading, and Schwarzenegger’s Midwestern farmer is no different from the others in that regard. Academy Award nominee Abigail Breslin (Little Miss Sunshine, Zombieland) stars in the titular role. Before the events in the movie, Breslin’s Maggie got infected by the “Necroambulist” virus—a disease that turns the infected into cannibalistic, flesh-decaying zombies. The film opens on Wade finding Maggie after searching long and far for her before he tracks her down and takes her home for the remainder of her days. Little goes on after this. Most of the film revolves around Maggie coming to grips with her fate and watching her family fall apart because of her mere presence in the home. She and an infected boy share a relationship that plays out like The Fault in Our Stars with an undead twist, but doesn’t amount to more than a few minutes. Breslin turns in a great performance that gets fumbled by the editing as the film never really takes a steady direction. The zombie material is presented in a way never-before-explored, making the film worthwhile for fans of the genre. Maggie is a dying teenager in the Midwest infected with a disease that turns her into a cannibal monster. She simply wants to spend her final days with family and friends instead of getting processed and exterminated in a government structure. Her father just wants her to have everything she needs to go peacefully and local law enforcement keeps appearing to remind him about his daughter’s horrible fate. There’s no question that Maggie will turn, it’s merely a matter of when. And when she turns, what will her father do? Turn her over to the terrifying government program, or take care of the situation himself? Maggie is a slow-burning addition to the zombie genre that raises ethical questions over taking the violent, bloody shoot-out avenue. Leads Arnold Schwarzenegger and Abigail Breslin turn in solid performances as a father and daughter coping with her terminal illness of turning into a cannibalistic zombie. Despite a tedious plot, Maggie’s mild runtime makes it a worthwhile ninety minutes for fans of the fading zombie craze in pop culture. Zombies are pure fiction, but Maggie wants its viewers to completely apply themselves to the concept of a world with the walking dead and ask the questions Wade and Maggie have to ponder.